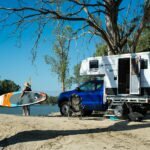 One of Australia’s premier hard-floor camper builders has allegedly closed down. A notice has been posted by clearing house, Auctioneering Link outlining details that all of the manufacture’s assets are to be sold off on February 15. Assetts include an NQR Isuzu Truck, bandsaw machine, pan brake press, metal cutting guillotine, angle grinders, compressors, dropsaws, edge bender, drills, screw drivers, mig welders, industrial fans, ladders, scrap metal, benders, a tinnie, and office equipment. Pictures of items to be auctioned include at least two unfinished camper trailers. Aussie Swag has been contacted for comment, although the company’s listed phone numbers is disconnected and its Facebook page hasn’t been updated since December 16. However posts from that time give no indication the company might have been struggling. 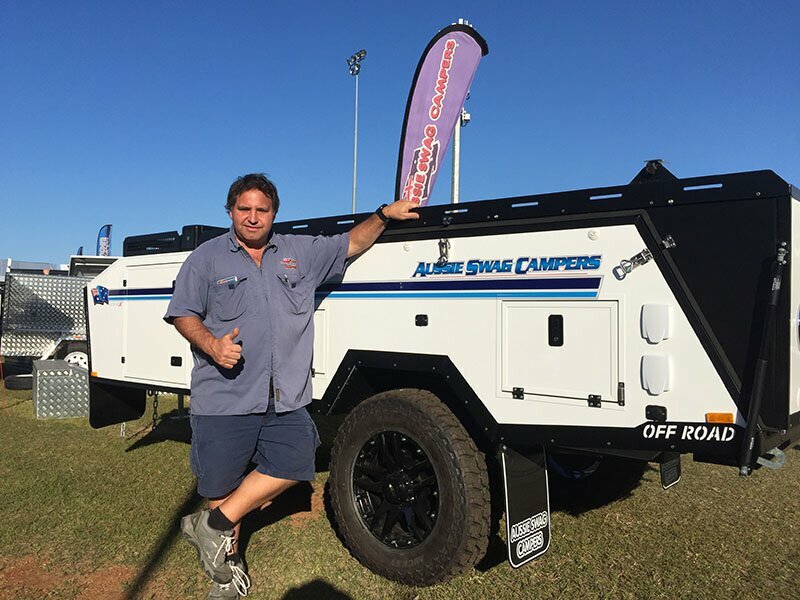 Aussie Swag Campers is a family run business that has been building hard-floor, rear-fold campers since 1985. The company has one a variety of awards for its products, and as recently as last year was displaying an automatically opening camper with very modern features. Paul Khoury of Auctioneering Link told ROAM that the company isn’t in liquidation, and believes the decision to close down wasn’t a result of insolvency. As we find out more, we’ll continue to update on the situation. Recently, Kimberley Kampers has also been in the spotlight, as it put itself into voluntary administration, although it is still trading. Maybe closed due to trying to build bigger and better campers, as our new camper still leaks, they don’t care now. No warranty backup. I think it is very sad. We have had 15 years of wonderful travel with our Aussie Swag Classic and it is still going as good as the day we bought it. Always found the owners to be more than helpful with any enquiries we have had. I’m sure Chinese imports have killed them and Kimberley Kampers too but the workmanship is second to none and those who have bought the cheap Chinese imports will soon realise that they don’t stack up to Australian conditions. No it’s because idiots out there are buying cheap Chinese forward fold camper trailers and thinking they are getting something as good as an Aussie built product. If you’re having some trouble with it that’s far enough, but you will be having alot more trouble if you had of bought a cheap Chinese forward fold. My father and I built Aussie swags for 30 years up until the end of 2016 and there is nothing better out there. I then worked at a brendale based forward fold camper trailer outlet for 9 months and all I can say is trying to fix them was a nightmare. Good luck to those who buy Chinese forward fold rubbish, your going to need it. Sorry to see the best built camper trailer company Australia has ever seen close the door. Think Aussie swag has been around for 32 years. The roads 32 years ago where shocking, Love to see a Chinese forward fold take those roads on. That’s right they wouldn’t be able to. 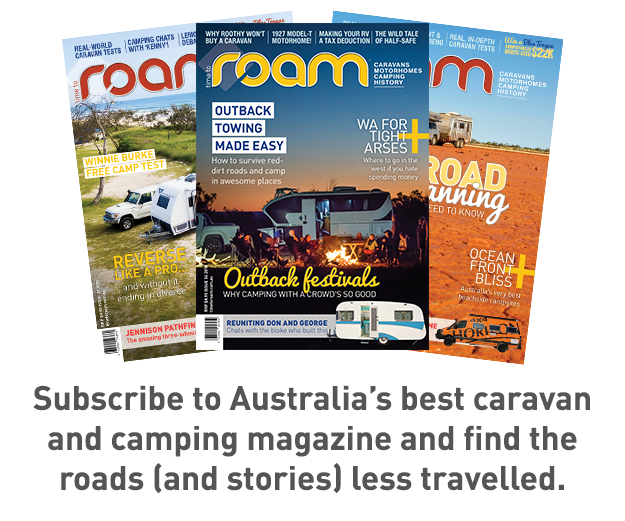 Aussie built camper trailer companys employ more than double that of Chinese forward fold camper trailer outlets. Great way to keep industry’s alive in Australia for our future generations. Have a CYT (another quality Aussie built camper). I like the fact that when I travel the punishing roads in Cape York, Central deserts, Kimberley’s, Kakadu etc that I don’t have that deep down feeling in my guy that the camper is going to break. The cheap imports owners can keep kidding themselves … It’s a shame another company has to go due to the changing market. Saddened to hear the builders of a premium product have shut the doors. Bought mine in Nov 14 and have used it on some of the toughest roads/tracks in Aust. It has behaved impeccably with many thousands of hard tracks still in it. Always had great service from James. I realize budget plays a big part in people buying chinese products,but in the main the imported products are inferior I think tougher regulation of caravans/campers sold in Australia ensuring quality and safety is neeed. But how does an Australian company compete against $7 per hour.The big loser is Aust workers ,parts suppliers and Australians in general due to a reduction of taxes paid. This will continue and Australian manufacturing will end up like the dinosaur. We have owned our Aussie swag ultra for six years and have had so many good off road trips and never had a drama. Aussie swag is the best and we have always had great support from James , it’s a real pity cheap imports might affect so many jobs and a great family run business like Aussie swag. Sad to hear this, we have had out Ultra Explorer since 2011 & done many trouble free trips. I did have the felling that the later models had too much equipment included trying to please fussy new purchases who should have been staying in a motel or a caravan. We hope to keep our A/S in the family for many more years. It’s really not the public consumer that is totally to blame. Why don’t you focus your attention to our spinless politicians selling your business down the drain? It’s called free trade. We give our good stuff away and consume others crap. So sorry to hear this. We have had an Ultra D for 6 years and have done many wonderful trips in the outback with it, with plenty more to come. We know that it will still be going strong long after all those Chinese imports have fallen to pieces or rusted away. When we travel on the rough dirt roads, we are more concerned about damage to our vehicle than the camper. Superbly built with wonderful features – a credit to the Fernance family. Scott and James provided tremendous back up service for us – greatly appreciated. They were very passionate about their product. Good luck to you both in the future. Yeah, it’s too bad. We have traveled Australia in ours’, including some very rough country (Bungles, Gibb River Rd, Tanami etc) and its gone everywhere our Landcruiser towed it. And when I’ve called to ask them a question etc, they have been great. We have had our Ultra since 2010 and have travelled over 100000km with it and still going strong with no hassles. Very sad to hear that they have closed. We have seen many shot chinese knockoffs less wheels and suspension recently. We had our Aussie Swag Ultra for 5 years and did all the rough stuff. Also, we lived in it for 4 of those years. Not many campers would stand up to that usage. Still in outstanding condition when we sold it. I sincerely hope that James and Scott do well in their future endeavours. Exceptional quality and customer service.